Cut flower growers have some of the same pest problems as vegetable growers. Vegetable Notes is a newsletter written every week during the growing season and includes information on pest emergence in Massachusetts . 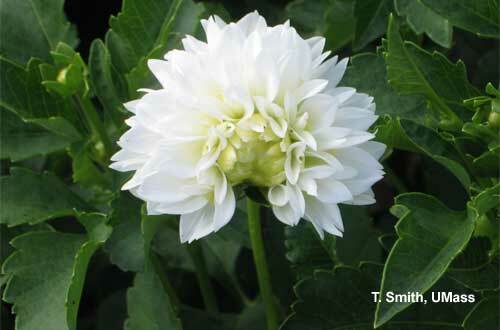 Cut flower growers may find the information helpful. See the UMass Extension Vegetable Program website for past issues and more information. One such common pest for vegetable, fruit and flower growers is the tarnished plant bug. Many times growers see pest damage before they notice the pest. This is usually the case with the tarnished plant bug. Symptoms of feeding can result in injury to flower buds, causing them to abort and drop, or the blooms not to open properly or be distorted on one side. Other types of injury include deformed leaves, scarred and discolored stems, or leaf petioles. The tarnished plant bug is a very general feeder, attacking many kinds of trees and herbaceous plants. It feeds on many flowers including dahlia, aster, calendula, chrysanthemum, cosmos, gladiolus, poppy, salvia, daisy, sunflower, verbena, zinnia, and others. It has piercing-sucking mouth parts as do all the true bugs. The long sucking mouthpart is inserted into the plant tissues and introduces toxic saliva into the plant as it feeds. The toxin kills cells near the feeding site causing the distortion of the growth surrounding their "sting marks", yellow or brown spots or wilting of new growth. The heaviest injury often occurs during mid to late summer and is most evident during hot, dry weather, especially adjacent to recently cut hay fields. The first few generations develop on preferred hosts such as small grains, alfalfa, wild grasses, vetch, dock, and fleabane. As hay is cut or as other plants dry out, tarnished plant bugs migrate in large numbers to succulent hosts, which may be your cut flowers. The adult is a small, flattened bug, about 1/4" in long, bronze in color with yellow and black markings. There is a clear yellow triangle, marked with a black dot on the lower third of each side. Tarnished plant bugs have a gradual type of development, and the young become more and more like the adults as they go through each stage. Young tarnished plant bugs, called nymphs are small, green and resemble immature aphids. As they get larger, they look similar to the adults except they have wing pads. Adults will fly when disturbed or they will run rapidly and hide underneath the leaves. 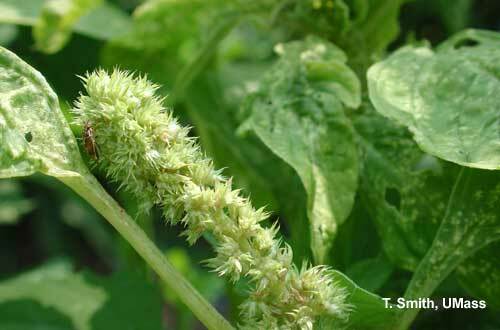 Tarnished plant bugs overwinter as adults in weedy areas. Starting around the beginning of May, the adults become active searching for food and suitable sites to lay their eggs. They exhibit a strong preference for plants just before and during flowering and are a problem at this time for strawberry crops. Eggs are laid inside plant tissue, in buds, soft, young stem tissue, or leaf veins. Eggs hatch in about 5 to 7 days. There are five nymphal instars. It takes the tarnished plant bug as long 40 days (at 53F), and as short as 12.5 days (at 93F), to progress through the five nymphal instars. New adults begin to lay eggs in about 4 to 8 days, and will lay about 1 to 3 eggs per day and about 30 to 120 eggs per female over her lifespan. There are usually two or three generations here per season. By midsummer there may be great numbers of them present, but because of their habit of hiding among the foliage and their protective coloration, they often go unnoticed. There are several different methods that can be used to monitor plant bugs including the use of white sticky cards, sweep sampling and tapping. White sticky cards are used in orchards and cut flower growers may want to try this in their field. Cards should be checked at least once a week. A sweep net may also be used to sample for the presence of adults and nymphs. Lightly brush the top of the foliage as the net is passed back and forth above the crop. Then count the plant bugs collected. Visual inspection of leaves, stems, and branches and tapping foliage over a white pan or small bucket can also be used to monitor, particularly for nymphs. Tarnished plant bugs can be difficult to manage due to their mobility. Besides spraying with an approved insecticide, a grower can manage TBP with cultural practices including the removal of weeds and the elimination of trash and other debris in areas that provide overwintering sites. Mowing grass and weeds around production areas may also help to eliminate sites where the tarnished plant bug breeds. Preventing weeds from forming young buds and flowers will keep populations lower in the weedy areas. Once weeds flower and the tarnish plant bugs colonize them, the bugs will tend to remain in the weeds unless the weeds start to senesce, dry, or are mowed. Then they will move to other plants. Pesticides may be needed to prevent damage to flowers. Note that chemicals will have no effect on the egg stage inside of the plant tissue. There are several species of wasps that attack the eggs or nymphs of TPB. One parasitic wasp, Peristenus digoneutsi was introduced from Europe to control plant bugs in alfalfa. This parasite attacks the nymph stage and has become established in New Jersey and many areas of New York . However, at this time biological control does not provide adequate control. Foliar sprays of a label pesticide can be applied when plant bugs appear in the field, and reapplied as needed. There are differences of opinion as to the best timing for treatment. One source recommended treating early in morning when the bugs are still sluggish from cooler temperatures. Another source, for orchards, recommended treating on a warm, sunny, calm day when TPB are most active. All sources however, strongly recommended weed control to reduce overwintering populations. Read labels to determine whether specific products are registered for use against plant bugs on target flowers. Before using a pesticide for the first time or on a new crop or cultivar, treat a few plants and check for phytotoxicity. Coli W. Editor. 2003-04 New England Apple Pest Management Guide. University of Massachusetts Extension. pp. 42. Daughtrey, Margery, and M. Semel. 1987. Herbaceous Perennials: Diseases and Insect Pests. Cornell Cooperative Extension. English-Loeb G. Biology and Management of Tarnished Plant Bugs in Strawberries. 2004. Berry Notes, University of Massachusetts 16(7): 2-3.